Opening Times: Mon-Fri 0700-2200, Sat-Sun 0800-2000. Club times (exclusive) Tue & Thu eves. A Lottery grant was awarded for a brand new track here and the work started in August 2000. 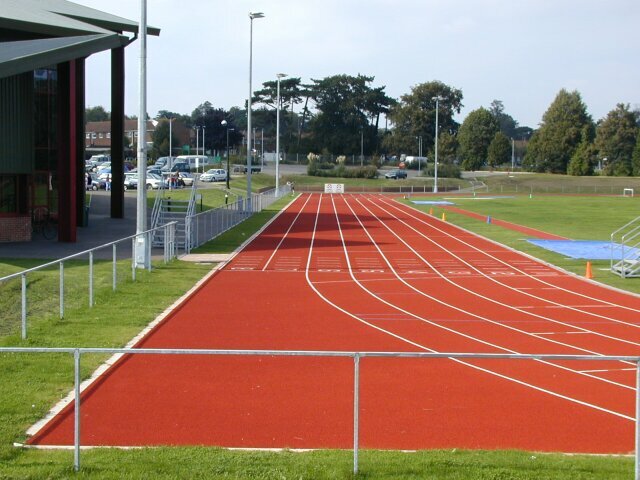 The track surfacing which was done by Fox Sports Surfaces using a Conica Conipur texture spray was completed in April 2001 and the lane markings were completed by Athletics Markings Ltd. on 4th May 2001. The track was first used for training by the host club on 4th September 2001. It was originally built with the main LJ/TJ runway inside the track alongside the home straight and the SP fan inside the top bend. However as the track would probably not have gained a full track certification if the main runway remained there because of safety concerns with the interaction of long throws, it was decided to build new runways inside the top bend. This and also the proximity of the original SP fan to the PV runway meant that the SP fan was moved outside the track next to the car park. The building next to the track is the Body & Mind Health & Fitness Club at Canterbury High School who manage the track in a public private patnership. The "Sports Centre" and track were officially opened by Richard Caborn, Minister for Sport, on 26th February 2002.